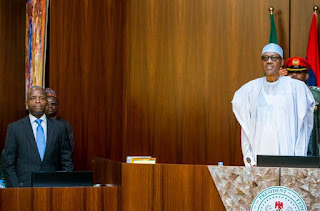 President Muhammadu Buhari on Tuesday expressed concern over the non-payment of salaries by state governments, in spite of interventions by the Federal Government. Buhari assured that the Federal Government and state executives would work closely towards ameliorating the situation of workers across the country. Speaking with the delegation of Nigerian Governors’ Forum, NGF, led by its Chairman, Abdul’Aziz Abubakar Yari, at the Presidential Villa Abuja, the president noted that the plight of workers in the states needed urgent attention as many could barely survive. According to Buhari, “How can anyone go to bed and sleep soundly when workers have not been paid their salaries for months. “God has been merciful in hearing the prayers of his servants so the rainy season has been good, you can ask the Kebbi State governor on this, and our enormous food importation bill has gone down,’’ he said. Buhari also directed all government agencies to comply with the Treasury Single Account (TSA) in order to ensure more transparency and prudence in accounting for the revenues of the government and the sharing of entitlements with states. In his remark, Yari said the various interventions by the Federal Government, which include the bailouts, were judiciously utilized by the states, stressing that the governors inherited backlog of unpaid salaries and huge debts portfolios on assumption of office.